Seoul may feel a bit overwhelming when you first get there. The saturated glow from the neon signs reflected on the wet pavements, the crazy outfits, the loud vendors trying to get you to buy their delicious food and the juxtaposition of all of that against the beautiful shrines and traditional temples can confuse their visitors. The different souls of Seoul are represented in the different neighbourhoods of this vibrant city. Myenongdong is the Korean shopping mecca. There’s no better place to take advantage of the street food that made this country famous or experience the neon-lit, loud and crowded life that comes to mind when thinking of South Korea. Hongdae is a hipster neighbourhood filled with cafés, university students and reclaimed factory buildings. It’s also extremely well-linked to the airport, making it the best choice for many travellers and the location of some of the best hostels in Seoul. Gangnam is the neighbourhood that gave the name to PSY’s infamous song and it’s home to the rich kids of South Korea. Think big skyscrapers, chic boutiques, and amazing clubs. If you’re after a more traditional experience of South Korea Jong-no may be your best bet, giving you the possibility to explore old traditional Korean villages like Buckchon Hanok. The hostels in Seoul are numerous and some of the best in the world. Expect impeccable cleanliness and design, free breakfast and amazing rooftops. The positive thing about Seoul is that the city doesn’t have one specific centre, but every area has its own attractions and vibe. This means that rooms start from about £10 per night anywhere and that you can find your perfect match without breaking the bank. Are you ready to experience the famous cubicle hostels of Asia? Want to stick to the traditional hannock decoration or are you more into a kawaii vibe? Are K-Pop stars your daily soundtrack and bibimbaps your guilty pleasure? Then get ready to discover the best hostels in Seoul – they will give you all of this and more, Gangnam style. The perfect hostel doesn’t exi- except it does, it’s in Seoul and it’s called Zzzip Guesthouse. We’re talking a hip and fun neighbourhood, plus two hosts – Bryan & Gina – who will help you with whatever you may need, from finding a hairdresser to getting to your favourite K-pop group concert. Zzzips’s one of those hostels that has the ideal atmosphere for creating life-long friendships. If Time Travelers Relax Guesthouse could be described in two words they’d be Read & Relax. All it takes is one look in the common room filled with books and plants to get the chill and laid back vibe of this hostel. What’s more, the rooms are decorated with amazing art made by the host! Ok yeah, Lian Guesthouse’s location may be great and the beds may be comfortable but the real star here is Nary, the host, also dubbed as The Korean Mom You Never Had. Prepare to be taken out for dinner every day by this sweet lady, who will also make you breakfast in the morning and make you fall in love with her so much that she’ll be the only thing you’ll be able to talk about in your hostel review. Dalbit means moonshine in Korean and it’s the reason why this beautiful hostel is decorated with shades of yellow and blue – the colours of the night. Seoul Dalbit Dongdaemun Guesthouse offers a variety of double rooms and staff willing to help you out with any problem you may have, even taking you out for drinks! Expect clean and modern facilities at Neo Seoul Guesthouse, industrial wood and concrete interiors and I’m in an episode of Suits kinda vibe. You’re probably not there to do business, but if you were you’d lock down that million dollar deal baby (at hostel prices – of course)! If you’re a regular backpacker, the outdoor terrace and lounge room are great places to chill after a day spent exploring the city. Kawaii in Korean means cute and it’s the perfect word to describe this pastel coloured hostel, filled with hand-painted curtains, pillows with pretty smiles and an espresso machine that would make any barista scream with excitement. Book Hongdae The One Hostel and get ready to press that upgrade button for your Instagram feed! If the reason you’re in Seoul is to make some memories and forget others, Time Travelers Party Hostel is for you. Kick off your stay with the weekly Korean BBQ and enjoy the in-house basement bar and one too many shots of soju, then venture into the streets of Hongdae to live the time of your life. It’s obvious right now that all you need to win us over is a rooftop with pretty lights and a hammock, a weekly barbecue party and a common room with games and a projector. No biggie, right? Haus Guesthouse has all of this, plus a cat, which, little-known fact, is the perfect cure for a hangover. Bunk Guesthouse is a very hip hostel located in the lively neighbourhood of Hongdae with a cosy common room, a fairy light lit patio, a weekly schedule filled with parties (from Korean BBQ to wine and rice). Oh and a host that organises nights out, drinking games and will get you fried chicken when you’re hangover – hi Brian! If you’re worried about the morning after, just know that this hostel also has an amazing coffee machine and a free breakfast with Nutella. If you are looking for the comfort of a private room but still feel like making friends and having someone to hang out with after pounding the soles of your shoes on the glowing pavements of Seoul, Hongdae Lazy Fox Hostel is perfect for you. Enjoy the free breakfast, the friendly staff and the amazing common room filled with board games and memories to be made. This beautiful new hostel is located on the 11th floor of a skyscraper in the Old Seoul, giving its insta-worthy common room a breathtaking view. Offering a wide variety of private rooms and dorms, Hostel Haru is the perfect choice for people with an eye for design and an Instagram feed to fill. Seoul I Guesthouse is decorated in the traditional hannok style and offers a variety of private rooms and dorms to satisfy everyone. The fully equipped kitchen is a great way to save money and meet travel buddies, while the rooftop terrace makes for the perfect location for a beer at the end of the day. Located in the middle of Myeongdong, this hostel offers one of the best positions in the city. You’ll have a beautiful and clean hostel to come back to after all the shopping and eating you can do in what is one of the busiest and craziest neighbourhoods in Seoul, pretty perfect, uh? The best asset of the Cube Hotel is its stunning rooftop that offers a breathtaking view of the famous N Tower, making it the best place to have a barbecue in Seoul. The space is beautiful – it was designed by the host himself, who’s an architect – flaunting a juxtaposition between hardwood and concrete that gives the whole place a very industrial and hip vibe. This one is for the foodies and for anyone who appreciates being graced with street food smells when they open their front door. K-GrandHostel Myeongdong is right in the centre of the action. That being said, this hostel still manages to be tucked away from the craziness of Seoul and gives a luxury hotel vibe with its clean and modern design. Located in the fanciest neighbourhood of Seoul, Gangnam, the JA offers a homey feel and amazing coffee all day long. On top of that, they give bagels for breakfast, every day. I don’t think you need to know more. Seoul not only has deep-house clubs and crowded streets, but there is also a quiet part of the city, filled with incredible shrines and an atmosphere that will take you back in time. Socuri Home Guesthouse is perfect to explore this part of Seoul as it’s located 5 minutes away from the Gyeongbokgung Palace. Ever wanted to experience the famous cubicle hostels of Asia? Your decision, but Seoul Cube Hostel would be an amazing choice. Why? Well there’s the breakfast – eggs, juice, coffee – hardwood beds with luscious curtains for added privacy and a cute little rooftop space to relax with a cold beer. Uni, the owner of Brownie Guesthouse, will welcome you into this cosy space with advice and a smile. Enjoy the newly decorated space and the perfect location right outside the subway, that will allow you to reach any destination in a matter of minutes. Just like the name says, the Lazy Fox Den is perfect for the lazy ones. Not lazy as in ‘I don’t want to leave the bed’ but more lazy like ‘I don’t want to worry about anything’, because, between the great location, the friendly staff (say hi to Jinny!) and the free breakfast, you can just enjoy Seoul! We hope this guide helps you discover the perfect hostels for your trip to Seoul. Let us know in the comments if you’ve stayed in one of our recommended hostels, or if you’d like to share a hostel that you think other backpackers shouldn’t miss. 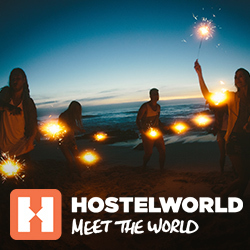 The post The 20 Best Hostels In Seoul appeared first on Hostelworld Blog.